Jack Doyle has a knack for ferreting out dangerous situations, as shown in McEvoy;­s appealing fifth mystery featuring the Chicago-­based ex-­boxer and horse racing enthusiast (after 2012;­s Photo Finish). Retired race horses are often donated to vet schools for research. When someone starts killing the animals to keep them from being exploited, two FBI agents ask Doyle to use his racing contacts to seek leads. That chore doesn;­t keep Doyle from jetting to Dublin, Ireland, to see jockey Mickey Sheehan win a major award. In Dublin, Sheila Hanratty asks him to help her bookmaker husband, Niall, who;­s had several suspicious accidents recently. Doyle also tangles with a wealthy social media entrepreneur who;­s determined to force an elderly couple to sell him their prized horse. On top of all that, Harvey Rexroth, a crook Doyle help put in prison, is arranging to have him killed. McEvoy deftly manages his busy plot while liberally spicing it with intriguing racing stories. Holy Smoke! It’s Mezcal! is being acclaimed by leading experts in the mezcal and spirits world: “An amazing accomplishment”, "For those of us that live and love mezcal, we finally have a book", “The best book on this beautiful artisan spirit”, and “A playful yet responsible thesis of the history, lore, and science that infuses every bottle”. Mezcal is finally being counted among the world’s leading beverages for its quality, complexity and authenticity. 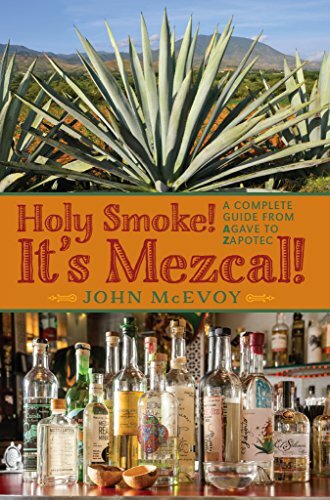 John McEvoy, the author of the outstanding blog Mezcal PhD (www.­mezcalphd.­com), pens his first book on this magical elixir. Holy Smoke! It’s Mezcal! is a passionate journey into everything you want to know about mezcal. Among other things, the author explores the history of mezcal and how it differs from tequila, the hand-­crafted production process that has been handed down from generation to generation, the wide variety of agaves which are used to make mezcal and how each varietal can alter the flavor, all the mezcal brands found . . .
Ex-­amateur boxer and failed advertising account executive Jack Doyle, hero of Blind Switch, returns to the world of thoroughbred horse racing at a suburban Chicago track. With the help of furrier-­to-­the-­mob Moe Kellman, Doyle is hired as publicity director at Monee Park - a struggling racetrack owned by heiress Celia McCann. Celia, whose husband is afflicted with Lou Gehrig's disease, is fighting to keep the business afloat while awaiting passage of a law allowing the introduction of lucrative video slot machines. She's determined to maintain the business inherited from her beloved uncle Jim Joyce. However, she is under pressure from her co-­heir and cousin, Niall Hanratty, to close the track and sell the valuable property to real estate developers. Niall will stop at nothing to convince Celia to sell, even hiring thugs from Chicago's Canaryville neighborhood to help persuade her. Can the exploits of star sprinter Rambling Rosie save the track? Or will Doyle hold the key? Written . . .